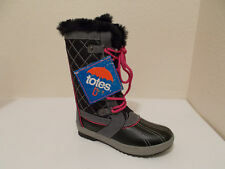 Totes Toddler Snow Boots Size 8 New with tags Black with faux fur trim Zip front Length under 7 inches Width at toe under 3 inches Waterproof & warm Never worn. My baby outgrew them before our first snow this winter. Very cute! Zipper closure. Round molded rubber toe. Excellent condition but no insert (insulated pads). Grip sole Condition. Kids snow boot. 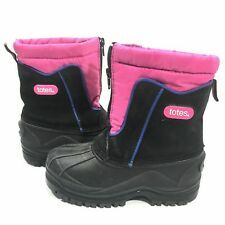 Toddler Girls Snow Boots with Faux Fur Lining . Shipped with USPS Priority Mail. Faux-fur lining. Lace-up & zipper closure. TPR outsole. Synthetic upper. Padded footbed. Front lace-up/side zipper closures. Boot Details. 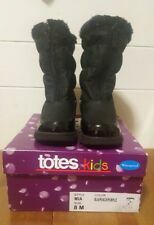 Totes Kids MIA Black Waterproof Insulated Boots in Size 8 Toddler. Boots are in great pre-owned condition. They show normal wear. Lots of life left in them! These specifically crafted boots combine current styling with maximum protection against cold weather. 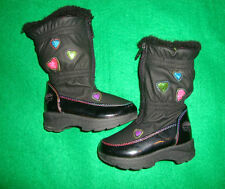 TOTES~girl's~WINTER/ZIPPER/FRONT/FAUX/FUR/LINED/SNOW/BOOTS! (5/M) "euc" @@ NICE! SEE PHOTOS. ON THE "OUTER/SIDES" OF THE "SNOW/BOOTS/ARE/GLITTER/HEARTS"! (SEE PHOTOS #1, & #7) THERE ARE ABOUT 5"~"CENTER/FRONT/ZIPPERS"! (SEE PHOTOS #2, & #9) THERE IS A "FAUX/FUR/TRIM" ON THE "INSIDE/OF/SNOW/BOOTS"! Totes Pink Boots. Faux Fur Lined. Toddler Size 7 M.
Please reference photos for additional description. All items are as listed. Some items may have be washed to insure quality products. Any pre-owned item is expected to have some fading from washing. All items are STORED in a smoke-free environment. Additional pictures or other questions please ask prior to bidding..Make sure to look at my other listings..FREE SHIPPING ON ALL BUY IT NOW ORDERS Only is USA..free shipping is not available on best offer orders, auction style listings or overseas..Returns accepted within 30 days of confirmed delivery, return shipping is paid by buyer and is subject to up to a 20% restocking fee.